I picked this flyer up at the Topeka auction house here in Indiana. I found the terms of the race pretty interesting–“a limit of five horses per race”; “all drivers must wear a helmet”; “any type of cart or buggy may be used except race sulkies”. 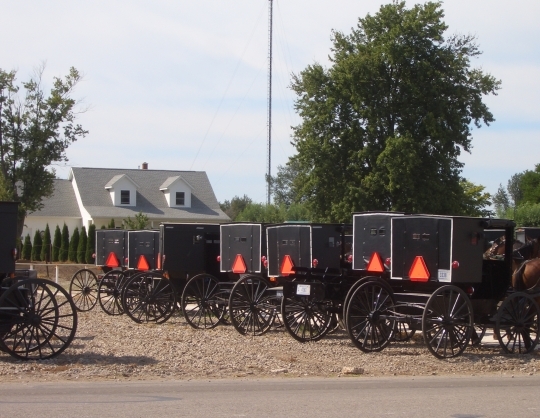 I assume this is aimed at young bucks and won’t see too many married men, but who knows (Amish in Kansas also participate in buggy races; check out the photo at the link). They run the Hicksville race for a half-mile, and the winner of each race gets “a halter and lead chain”. As it happens Topeka holds annual July 4th “buggy pull” races. If you missed it I posted a video here: Topeka buggy race. Topeka reminds me in many ways of Mount Hope, Ohio: an “Amish town”, with relatively few tourists but a lot of buggy traffic, numerous Amish homes in and around the town, and a bustling auction house. I also visited Hicksville, Ohio a few days back. My impression of this community had been formed by Hicksville Amish I’d met in other settlements (mainly ones who’d moved to the Elkhart-Lagrange settlement). Based on these meetings I’ve always thought of Hicksville as very friendly folks. Okay, it was a pretty small sample size of just a couple families, but my visit to Hicksville supported this notion. I’ll have more on Hicksville in an upcoming post. 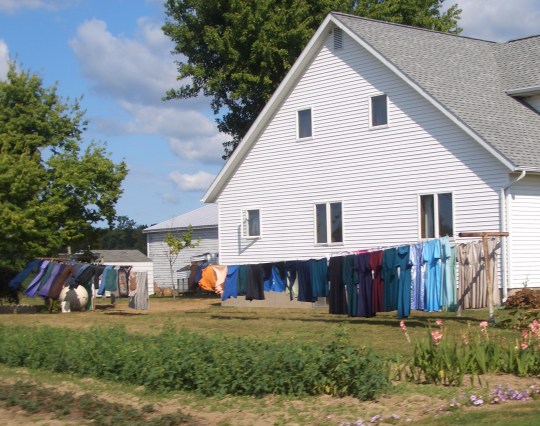 Today I am returning to the Nappanee and Wakarusa area to both the Amish and Old Order Mennonite settlements. Then it’s on the road again, back to Ohio. 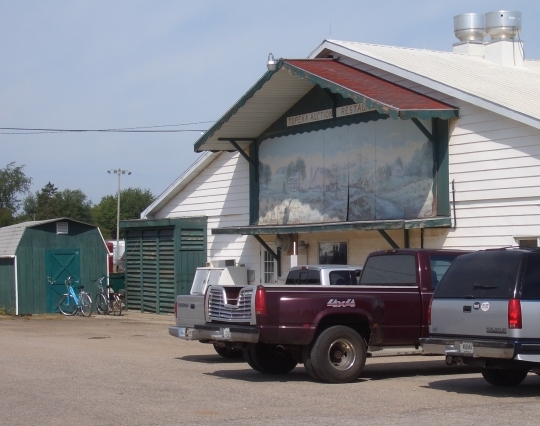 Hey Erik, you didnt happen to get a shot of that mural on the auction barn? I am interested in what it is about. We are planning on some murals for the Historical Society here, sort of like Behalt, but probably not as detailed. Mike I think I did. Shoot me an email to remind me and I’l try to zoom in on it and send to you when I get back to NC. It just says “Amish Races” – you sure there are buggies involved?? LOL! Hmm. 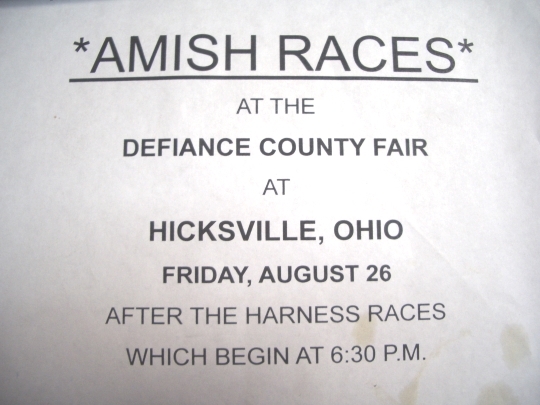 Not much special about “Amish Races”. Those happen every Sunday night after the youth singings. Of course, because of the danger, it is not allowed. But if your horse is so slow as to get passed, that is your fault. And if your girl is watching, maybe you don’t want to be passed …..
No they are certainly not rare in that sense, I interrupted one about to happen last Sunday. But how often do you see one formally organized, with a full slate of rules, out of state advertising, and prizes (not to mention helmets…)? not every Sunday 😉 Wish I was staying a day longer.
. . . happen at Sportsmen’s Park in Chicago; every other driver has an Amish name! I love the color palate of the dresses in the last picture, almost all my favorite colors except hot pink. I think that I would be perfectly OK with the pick of colors if I lived in this group. Hey, it seems I get involved in Amish races all the time — usually with young people who make sure they can go faster with their horses than I can on a bicycle. Last time, early this month, it was a small open buggy in LaGrange County, driven by a boy who looked to be maybe 11 years old, along with another boy of the same age and a girl between them. They passed me on a gravel road, and every time I just about caught up again, their small horse had had a breather and they took off again. After a mile or so we were on asphalt pavement where I could ride faster, but things continued the same way. It was a hot day, and I’m not sure the boy’s father would have approved of treating a horse that way, but it seemed to be doing OK.
Spokesrider, I bet! Even young guys have the racing bug. As Lance points out, parents don’t love them. Like parents of kids who drive their cars too fast. Not such a fair fight for you if the horse gets a breather.